In this long-awaited sequel to The Compound, Eli and his family can run but they can't hide. 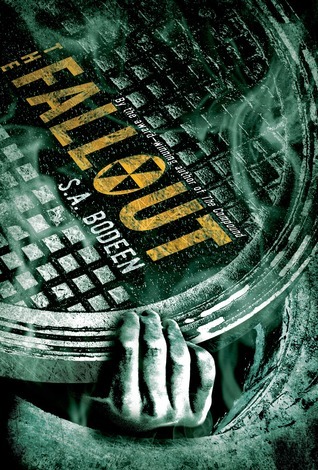 The Fallout is a book I was surprised to see come out. The previous book, The Compound, came out in 2008 and had a solid, wrapped up ending. Still, I was excited to see what was next in store for Eli and his family. Probably one of the important relationships in this book is between him and his twin brother, who both thought each other were dead for 6 years. Eli and the rest of his family was in the Compound, his father telling them the world had ended. Dealing with the awful things that happened and more family members, Eddy must relearn how to deal with his family and Eli and him are at ends throughout the book. So most of the first part of the book was adjustment. Because their past had been exposed to the press, the family is trying to start over all while trying to keep the spotlight off of them. In the meantime, all of them are trying to find a level of normal. Nothing is easy and there's envy and bitterness shared along with healing and realizations. I'm not sure how I feel about this book. The Fallout was a solid read, with enough relationship drama along with some action/adventure towards the end. All of it felt a little unnecessary though. Having not known what to expect, I did overall enjoy this book. I'm not sure it brought along the story from the second one. Like The Hunger Games, I felt further novels were not needed. That being said, I think readers coming fresh from having read The Compound will connect better with the story and characters. I felt that the younger characters were pushed to the back of the story and it truly was more about Eli and Eddy's relationship as twins that were separated for 6 years. I even felt the danger plot thrown in was simply there to help them repair their relationship. I guess I was just expecting more action? Final Verdict: The Fallout has the perfect title for the content inside, for there was quite a fallout happening after the first book. Also, this one is dependent upon you reading the first book. I felt like I missed a lot of nuances because it had been several years since reading The Compound. Oh, I read The Compund a long, long time ago! I didn't know a sequel is coming out. Thanks for this review! I probably never would have known if I hadn't seen it. This series looks great to me! The Compound came out long before I got obsessed with reading YA, so I haven't had the chance to read it yet, but now I really want to! I only skimmed your review since I haven't read The Compound yet, but from what I have gathered about this series it sounds like something I would really enjoy!